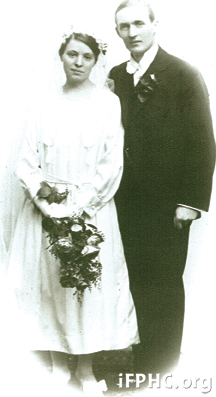 We’re telling the story of the missionary couple, David and Svea Flood. The story is adapted from their daughter, Aggie Hurst’s personal account, but the story is really about so much more than their little family. Today we begin Part 4. If you missed earlier portions of the story, you can find them here: Part 1, Part 2, and Part 3. A few years later, the Hursts were attending a high-level evangelism conference in London, England, where a report was given from the nation of Zaire (the former Belgian Congo). The superintendent of the national church, representing some 110,000 baptized believers, spoke eloquently of the gospel’s spread in his nation. Of course, the most dramatic moment came when the pastor escorted Aggie to see her mother’s grave. 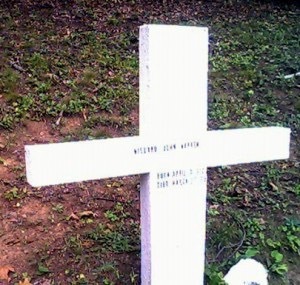 She knelt before the white cross in the soil of Africa—the place of her birth—to pray and give thanks. So, that’s the conclusion to this 4-part story of the One Seed. It took forty years before God’s amazing grace and His real plan for the village of N’dolera was known to Aggie Hurst and then to her father. It seemed all was lost, but God wasn’t done working. When we are in deep discouragement, we need to remember the story’s not over yet. One chapter may have ended, but God is still at work. If that’s what one seed can do, isn’t it amazing to think about all those other seeds that have been planted over the years? The story of God’s sovereign work is not over. He’s still planting seeds. He’s still growing believers. Click here to FOLLOW US. Fill out your email information on the right hand side of the page that opens. Our posts will be delivered directly to your email inbox. *Please continue to pray for the political situation in the DRC. *Pray for nearly 50,000 Christians who have been displaced by Islamic militants in the North Kivu province.